WASHINGTON, DC (Herald de Paris) — Canadian Prime Minister Justin Trudeau was welcomed to the White House today by US President Donald Trump. When Trudeau met President Obama the chemistry was palpable sparking dozens of “Bromance” memes. Today ‘s meeting was no less meaningful as Trudeau presented President Trump with a photograph of his father the Right Honourable Pierre E. Trudeau, Prime Minister of Canada with then-businessman Trump. The photograph was taken at the Family of Man award in New York City on Nov. 5, 1981. The elder President Trudeau was given the award for demonstrating an outstanding example of excellence in society. 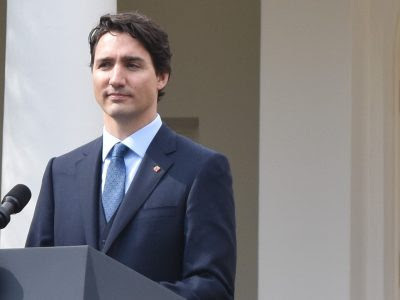 It was a master stroke by the charming younger President Trudeau, who shares some different ideologies from President Trump, serving to remind Trump personally and professionally his deeper relationship with Canada and it’s people. Canada and United States are close and indispensable allies. Both men attended a business round table comprised of over 50 women’s business leaders and jointly created a United States-Canada Council for Advancement of Women Entrepreneurs and Business Leaders. It is expected the initiative will promote the growth of women-owned enterprises and contribute further to overall economic growth and competitiveness, as well as the enhanced integration of our economies.